An entire issue of a newspaper dedicated to men. That put a smile on my face. Like most people, there have been some really good men in my life, so those will be the ones I focus on. My grandfather was a truly good man. No matter where he went, he took his children with him. He was the kind of patriarch that, even today, his 93-year-old daughter will preface her statement with, "Well Daddy said this," or "Daddy would do that." My grandfather was an excellent cook. He had been a cook on the railroad and whenever granddaddy was cooking, it was sure to bring the entire family out to his small house in Robbins. Every time I cook a pot of gumbo, I make it using a tomato base and not a roux because that's the way my grandfather did it. Growing up, I have had men in my life who made a major difference. Rev. Thompkins would drive to Cabrini-Green on Sunday mornings to pick us up for church. I can still remember his white station wagon coming down the street to get us. I can remember him asking, as we came of age in his church, how come Mary and Joseph couldn't be portrayed by black kids in the Christmas pageant? Without fanfare, my integrated church had a black Mary and Joseph. Thank you, Olivet Presbyterian, for practicing what you preached. My mother only had one brother who lived in Chicago and my Uncle Dave was always the subject of conversations when my aunts got together. He wasn't perfect, but he was there for his children, raised his family, and always did what this society expected of a man. When I was a little girl around 10, there was a man, Mr. Cunningham out of Kankakee, who used to come into Cabrini in a white truck. He would bring bread, cookies, and donuts and sell it off the truck. He used to come and get me to be his helper. I can still remember his funny excuses when he would pull by the tavern to use the bathroom. He was always respectful of me, and I was like another daughter to him. I had several wonderful male teachers while in school. Mr. Wilson, my sixth grade teacher, Mr. Gant and Mr. Palmer. All three of those black men, who worked at Jenner Elementary School, made such a huge impression on me that over 45 years later I can still remember their names and faces. In high school, my music teacher Joel Helfand taught me to appreciate classical music and exposed me to the greater world around me. My Spanish teacher, Mr. Blaylock, instilled a love of language in me. I have dated some wonderful men. My ability to be friends with many of them once the relationship ended is a testament to the wonderful people they are. I still get Christmas cards, phone calls and invitations to go to plays with them even though our relationships didn't work out. I have wonderful male cousins. They are committed husbands and fathers. I readily think of them whenever someone starts to talk negatively about black men. When I see them still in marriages that have lasted well over 40 years, I use them as my reality. I have worked with some really good men. From being on the job with them, to those who are active in this community, to the ones who put this newspaper together, they are the unsung heroes who do the work without getting the accolades. Let us rejoice in our good men. Let us all take the time to accentuate the positive and negate the negative. Let's celebrate the good men who surround us. All I ask is that men take the time to find the boys who lack the proper etiquette of manhood and help direct them to betterment. When that happens, the problems in our community can be solved. 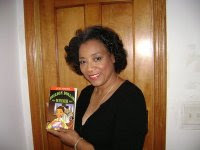 I will be at the Festival of Life, 55th and Cottage, July 2-5 from noon until 10 p.m., vending my novel at the Chicago Black Author's Network tent. Stop by and pick up a copy. Or call me at 773-622-3863.